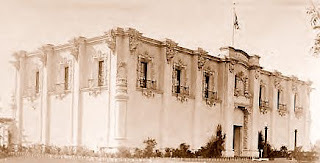 The International Harvester Company Building was located on the west side of the Panama-California Exposition's Alameda, immediately north of the Southern California Model Farm and Citrus Grove. 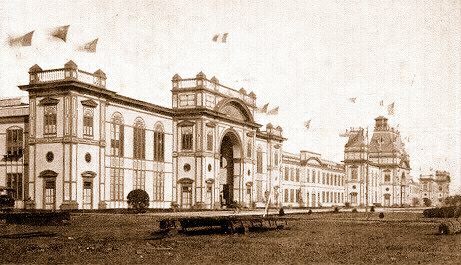 The large Spanish-Colonial style structure featured ornate balconied windows, canale-topped buttresses, vine-covered pergolas, and a roof-garden; and the interior housed displays of the company's latest farm equipment and machinery. 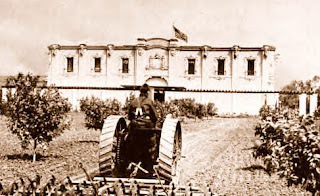 At the rear of the building was situated a model citrus orchard, irrigated with a complete modern irrigation system. West of the citrus orchard was located a large demonstration field, where numerous types of tractors, plows, harrows, cultivators, spreaders, and other farm machinery were shown in operation. The entire International Harvester Exhibit covered an area of five acres.